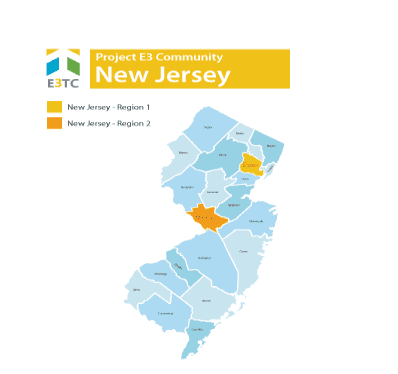 New Jersey is a location chosen as a targeted community through the Vocational Rehabilitation Technical Assistance Center: Targeted Communities (VR-TAC-TC) or Project E3. Project E3 will partner with State VR Agencies and local community partners to improve outreach and employment-related services to underserved people with disabilities in this community. New Jersey, also known as “The Garden State”, is among the leaders in many types of agricultural production. The state is a peninsula, bordered by the Atlantic Ocean in the east, southeast, and south. New Jersey is the fourth smallest state in area and the 11th most populous of the 50 states. The geographic location and factories in cities helped to drive the Industrial Revolution. Today, New Jersey is one of the most ethically and religiously diverse states in the country. With a median household income of $76,126 in 2016, well above the national average, and a poverty rate of about 10 percent, New Jersey is the second-wealthiest state in the country. In spite of this, large populations in New Jersey experience unemployment rates higher than the national average and median household incomes far below the federal poverty level. Community Engagement: Use existing local resources to engage community participation and create partnerships that lead to better collaboration between community agencies. These partnerships will inform ongoing decision-making and will promote the long-term sustainability of successful strategies and outcomes beyond the life of the project. Bridges Out of Poverty – Strategies for Professionals and Communities Training: Provide counselors and partners with a better understanding of barriers to and resources for serving the targeted populations. Braiding and Leveraging Resources: Increase the capacity and interrelationships of community partners and New Jersey Division of Vocational Rehabilitation Services. The goal is to build a coordinated and comprehensive support system, including connections to federal and state programs. Project E3 will provide New Jersey’s state Vocational Rehabilitation agencies and their partners with the skills and competencies needed to effectively and efficiently address barriers to competitive integrated employment and community integration encountered by persons with disabilities in these regions. We will leverage promising practices, knowledge, and experience gained from this project to expand employment opportunities for individuals with disabilities from underserved and economically disadvantaged populations throughout New Jersey and across the United States.